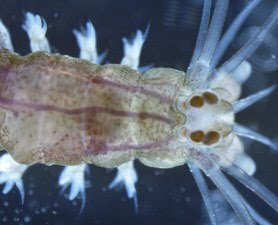 Brain structures directly related to the human brain have been identified in a marine ragworm, according to a paper published in the latest issue of the journal Cell. The discovery means that the origins of the human brain can now be traced back at least 600 million years, when we last shared a common ancestor with this species, Platynereis dumerilii, a relative of the common earthworm. “This worm lives in self-made tubes, explores its environment actively for food, and shows signs of learning behavior,” lead author Raju Tomer told Discovery News.